DesignMantic offers a suite of website and graphic design tools for the small company. DesignMantic wants to provide a low-cost way for the small business owner, doing their own branding, to complete with big-budget competition and look great doing it. DesignMantic Logo Maker is a DIY design generation tool that's easy-to-use and cost-effective. 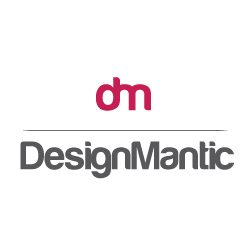 Start by entering your brand name into the DesignMantic logo generator, specify your industry and even add a slogan. DesignMantic generates professional-looking logos that you can choose from and then customize. Pick the design that you love and customize it to your desire. You can rotate the design, move the text, resize the image, change the font style and select specific parts of the logo to change colors. given in the drop down menu. DesignMantic Social Header Design lets creatives of all skill levels create a beautiful social media cover. Select from a gallery of templates and customize your Facebook cover page, Twitter header, LinkedIn cover image and Google+ cover photo in minutes. Just add your logo or display picture to DesignMantic's social media graphics and presto, you have an outstanding social media presence. With DesignMantic’s website builder you simply enter your company’s name to get started. The HTML5 website design tool is extremely easy to use. Drag, drop, or upload to customize your website to perfection, or edit, delete and start over. With our website builder you can’t go wrong.